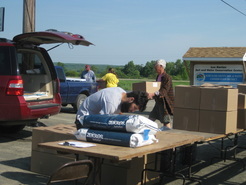 The district now offers two fish sales a year with one in the Spring and one in the Fall. Each sale provides a different assortment of fish along with fish food and pond supplies (Spring only). When purchasing fish please be sure to apply for the appropriate stocking permits that are required by NYS Department of Environmental Conservation. The links to these applications can be found below. 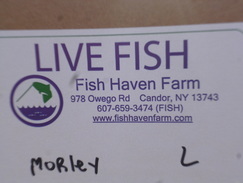 When picking up your fish they will be packaged in oxygen injected bags and placed in boxes for easy transportation. The order form for the 2018 Spring sale is now available. Follow the link below to view the sale and to print out an order form. If you would like to purchase Grass Carp, you MUST have a Grass Carp Stocking Permit prior to pickup. You can obtain an application by going to the New York State Department of Environmental Conservation (NYSDEC) website or at the link below. The permit is free and its duration is from March 1st to November 30th. We also ask that you apply for your NYSDEC Fish Stocking Permit which is required to stock fish in any waterbody of 10 acres or more. The application can be found at the link below or on the NYSDEC's website. You may also consider applying for the Farm Fish Pond License which is needed for ponds less than 10 acres. Both permits are free and last up to 5 years.